The original, top selling and best built! 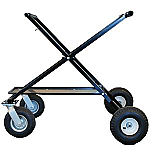 8” pnuematic front casters are great for rougher terrain. Large 10" rear wheel. Standard black powder coated finish. Standard Big Foot is built with 1 1/4" tubing- making this one stout stand! Perfect for heavier karts like TaG, Shifters and those many Junior level karts with an abundance of lead. 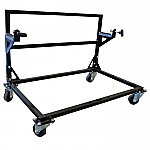 You want the Monster Truck of kart stands? The Streeter Super Stands Big Foot is it! Genuine Streeter Super Stands Upright Stand for sprint chassis. Accepts full width rear bumpers and up to 50mm axles.